Zion Collection: You don’t have to be Rastafarianto enjoy this Jamaican-flavored truffle collection. Vosges Chocolates wants to bring out your inner Rasta through its Zion collection, a seasonal group of truffles inspired by the Rastafarian culture and the words of Bob Marley. The flavored ganaches let you experience the spices, fruits and flowers of Jamaica: allspice berry, calabaza, hemp seed nut, Jamaican sorrel, fresh ginger, mango, hibiscus flower, tamarind and Scotch bonnet peppers. Rastafarianism is a religious and political movement centered in reclaiming African culture, identity and purpose. Rastafarians are mostly vegetarian and live off the land. They wear their hair in dreadlocks as a symbol of their dedication to God and seek spiritual enlightenment. Bob Marley was one of the first Rastas to bring the political struggle to mainstream music, spreading the message and increasing awareness. 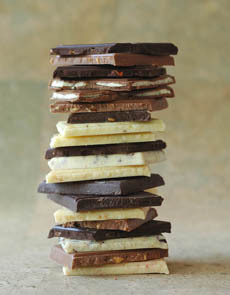 We don’t know if Bob himself has tried these chocolates, but you can choose nine pieces for $27.00, 16 pieces for $41.00. Available at VosgesChocolates.com. Read our review of Vosges’ line of exotic chocolate bars and ice creams. What happens when you’re looking for the best ketchup in America? You taste 42 of them (including the Big Three), as Stephanie Zonis did, and find that five, boutique brands most people have never have heard of, really rock. The good news is that the sixth brand on our hit parade, Muir Glen, is organic, kosher, popularly-priced and available at many natural food stores and in organic departments at regular supermarkets nationwide. The other “winners” make great holiday gifts for ketchup lovers. Take A Fresh Look At Ketchup, which includes the history of ketchup to modern times. It includes such nuggets as, while the Reagan administration did not succeed in getting ketchup named a vegetable, the [first] Bush administration did. 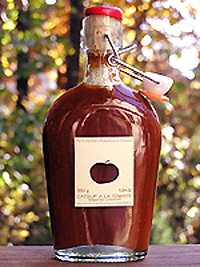 One our winners, from France, makes a nifty holiday gift for a ketchup lover. We had to eat it all for the review. Photo by Dhanraj Emanuel. Quick: What‘s the number-one selling chocolate in Switzerland? Here’s a hint: It isn’t Lindt! (But you can read our review of Lindt Chocolate, which includes some of the finest chocolate bars made.) Since you read the title of this post, we can’t put the wool over your eyes. But who, you ask is Frey (rhymes with sleigh)? The Frey brothers opened shop in 1887, just 12 years after fellow Swiss Daniel Peter created the first successful milk chocolate (using neighbor Henri Nestlé’s condensed milk invention) and eight years after Swiss Rodolph Lindt invented conching, the process that creates the smooth, silky chocolate we know today. Now, Frey wants a bite of the American market. So, savvy businessfolk, they honed in on America’s favorite retailer and are now available in all Target stores. A big, 3.5-ounce bar is just $1.99—and it’s not just Swiss milk chocolate. THE NIBBLE’s chocolate specialist, Peter Rot, takes on the extreme bars—13 flavors, including White Chocolate with Rhubarb & Aloe Vera, Milk Chocolate Tiramisu and Dark Chocolate with Hot Chilli Pepper. There’s nothing boring about Swiss chocolate. Read the full review of Frey Chocolate. St. Dalfour, the French company best-known for its sugar-free preserves, has come up with something quite clever: microwavable “ready to eat” mini-meals for people on-the-go. Given all the bad food we eat on the road (or late nights at the office, or at school) because healthy alternatives aren’t available, Gourmet On The Go is a welcome solution (in fact, at least one major airline is selling them to passengers). The best flavors are Couscous, Three Beans With Sweet Corn and Wild Salmon With Vegetables. The 6.2-ounce can is a satisfying portion, and for $3.95 it should be. The elegant can comes with a well-designed spork (a spoon-fork) that makes you feel as if you’re doing better than eating out of a can. The line is all natural and preservative free. Four of the six flavors are vegetarian, and two are gluten free for those on restricted diets. 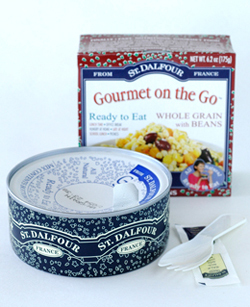 Read more about St. Dalfour Gourmet On The Go. Peel back the lid, and a tasty repast awaits. Buy enough to divvy because you won’t want to share. We get boxes and boxes of sweet delights sent to us weekly, and many provide great gustatory enjoyment. But a box of Divvies chocolate cupcakes and a tub of vanilla icing provided so much pure glee, we felt no need to add the multicolored nonpareil “sprinkles.” We had no complaints with the cookies and kettle corn either. This beautifully-packaged line wins the trifecta: It looks great, it taste great, and it’s free of some major allergens (eggs, dairy and nuts). Not surprisingly, it was developed by a mom with an allergic kid. 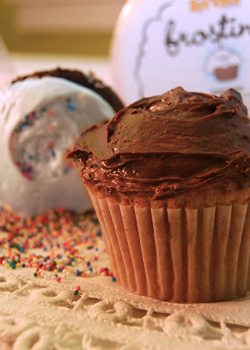 We’re happy that people with these allergies now have more delicious delights to divvy up, and we’re still trying to figure out how those cupcakes taste so great with no eggs or butter. Read about all of the treats from Divvies.